Tá dhá fhoireann peile againn sa scoil; foireann na scoile agus foireann na gcailíní. Bíonn deis ag cailíní agus buachaillí ó Rang 3 ar aghaidh páirt a ghlacadh sa pheil. Glacann na páistí páirt i gcluichí mar chuid de Chumann na mBunscol Áth Cliath agus mar chuid den Fingal League. The school has two football teams; a school team and a girl's team. Children from third class onwards get the opportunity to play for the school teams. 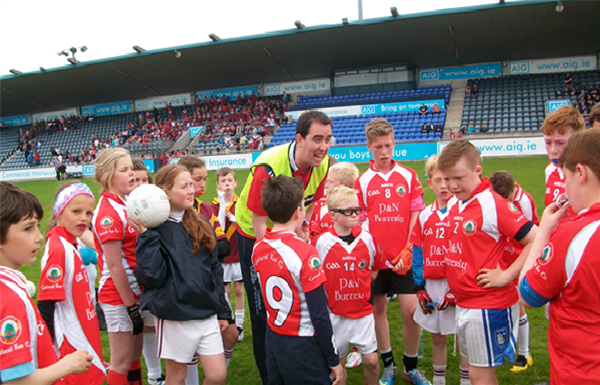 The children play in Cumann na mBunscol Áth Cliath agus Fingal League games every year.